Hero journey and legends farming. Im sure its in many different threads but ive been scouring the forums for a couple of evenings now and still havnt found the lists im looking for. basically ive got a mishmash of toons due to poor planning on my part early game. ive farmed pheonix squad and am getting on well with them but i want to start getting other squads ready and have decided to go for squads that will help me acquire the legendary toons. CLS and RJT are well out of my reach atm, but who do i need to get them? I know Pheonix need to be 7* to get Thrawn n Palp 7* but who do i need for the rest (R2,BB8 i know ive unlocked yoda but for the life of me cant remember who i used). I like playing the ship side of the game and would be cool if i could include the pilots in squads if possible? Obviously if they are terrible i would concentrate on the better characters. For CLS, it's Old Ben, R2, Leia, ST Han and Farmboy Luke. All 7* and minimum G8 I think. JTR is a late game deal as you need to farm Vet Han/Chewy whose nodes don't unlock until near max level. I think you need Fin and Rey and maybe another who I can't remember off hand. You Sir are a legend! Much appreciated. 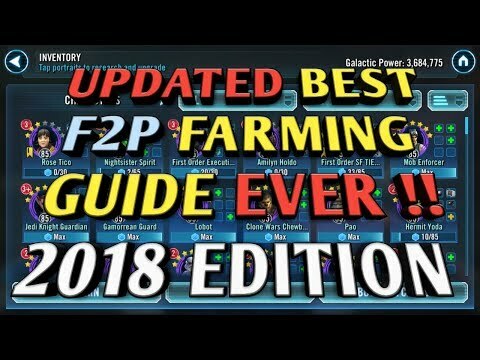 Here's a good guide on what to farm as you progress. May really help your development. Since you mentioned pilots, the Empire squad for R2 has nice overlap with pilots because you can run Palp and Thrawn plus Vader, TFP, and Tarkin. The FO squad for BB-8 is almost entirely pilots; you'll probably want First Order Officer, but KRU, FOTP, and SFTP are all single-ship pilots and Phasma, Kylo, and FOST are needed for the Command Shuttle. I wish this info was in a locked post under every individual event. So instead of sifting through the big thread and what droid "Daring Droid" is referring to, you can just go to the individual events, then the BB8 event and right there will be a list of required characters. Seems easy enough.